We have made some new friends at MaxEquations. We were pleased to hear from Gary last weekend and he nicely corrected the way we were spelling their brand name. Their artwear is reminiscent of Blue Fish and is embellished by former Blue Fish artist, Brian. 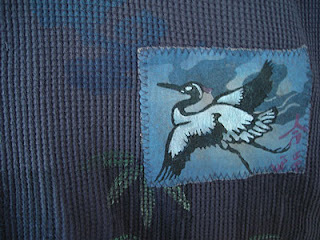 We have a thermal tunic painted with blue herons that will be going up on eBay this week. It is absolutely gorgeous. Check out our listings for MaxEquations as well as their own shopping outlets at www.maxequations.com and maxequationswearableart.ecrater.com.